Very Stella Mc Cartney meets Céline, love it! ohh those shoes are amazing! Want them too. You look perfect in this outfit! This outfit is perfect! The shoes are awesome and love how you styled the shirt underneath the cropped top! J'adore ton pantalon. Tu es toujours aussi jolie. Miss you !! 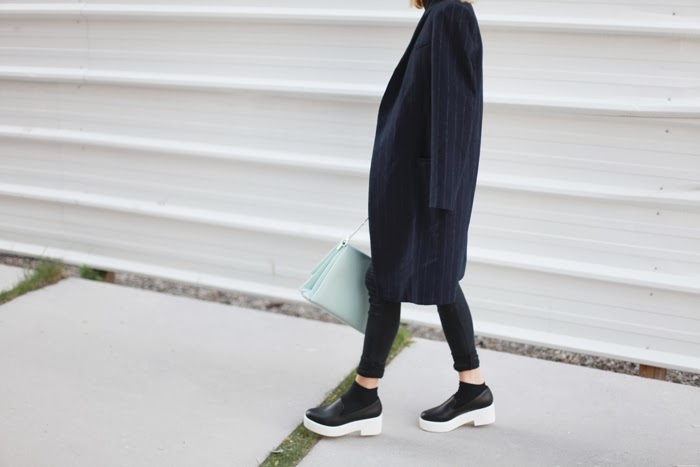 So much love for white soled shoes - you've styled them beautifully! Tres jolie tenue! J'adore ton jean et surtout, ton sac! Une magnifique couleur pastel!!!! You rock these shoes, great bag too! Très beau look, j'adore le manteau ! Love your look and the shoes! I am in the exact mood! I love the vince slip- on sneakers I got ...with a white sole!!! Les jambes de foliiies ! Ce pantalon est trop beau!! i loveeeee your jeans ! Le sac est la touche qui rend la tenue parfaite. Love your style as always !! JESUS MARIE JOSEPH tu m'as fait succombé ce look est divin ! Ce look est super, le jegging wahou j'adore.